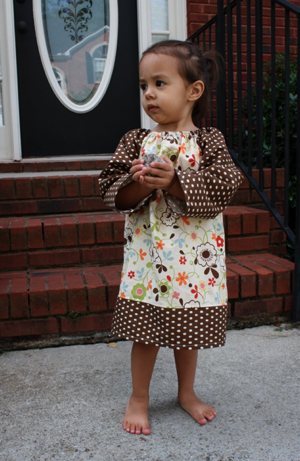 A friend came to me recently and asked me to make 2 peasant style dresses for her daughter. I readily agreed knowing they were all the rage these days, and I figured it would be a great chance to learn how to make them. 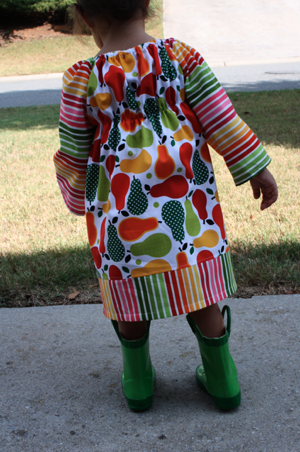 I hunted around for patterns, both paid and free, and didn’t find anything that struck my fancy. 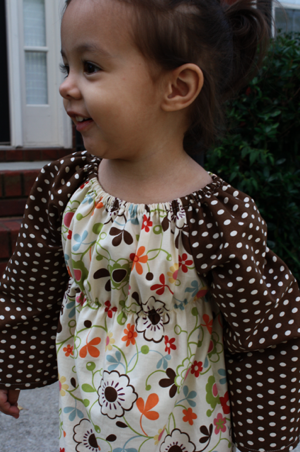 Then I stumbled on an old favorite blog of mine and found the perfect framework for the dresses I wanted to make. 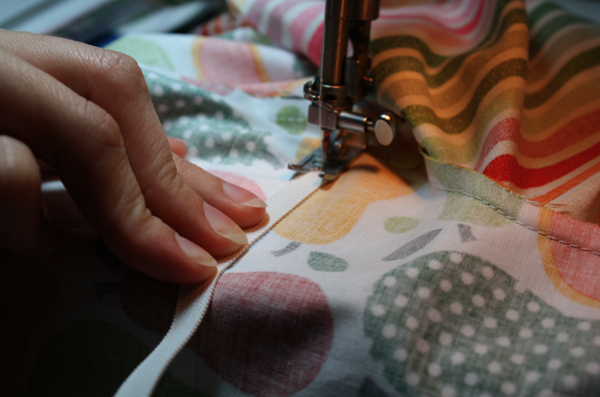 I spent some time reading, measuring, and experimenting before I began cutting and sewing. I was surprised how quickly they came together, and the options to personalize these are endless! 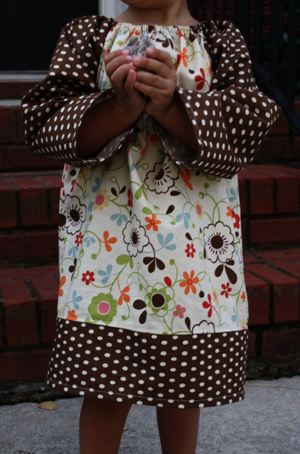 Sofie loved each one I made and had no problems modeling for me when I wanted to photograph her. 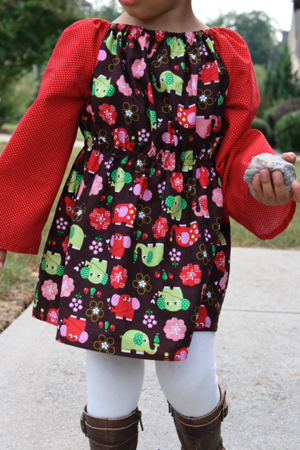 I’m so excited to have perfected a way to make the quintessential Fall Frock! I actually whipped up all 3 dresses in one day! Once I started, I just couldn’t stop! This elephant one is for Sofie and we’re mailing the other 2 to our friend. 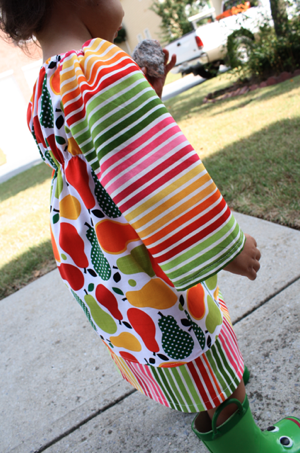 I practiced on one for her first so I could work the kinks out for the other 2. 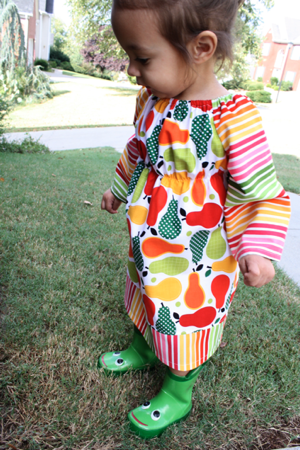 Sofie’s is short, so I think it’ll be the perfect fall tunic! 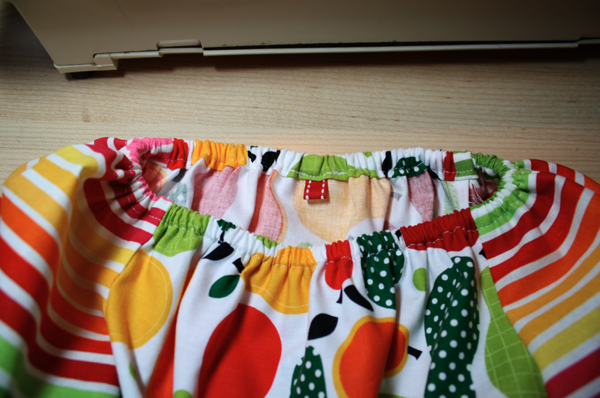 I also did the elastic closer to her waist but decided I liked it better higher. 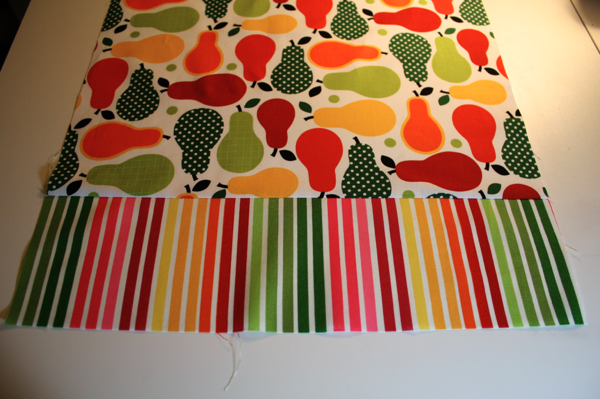 So after some tweaking, I developed this pattern that I’m sure to make over and over in the coming months! 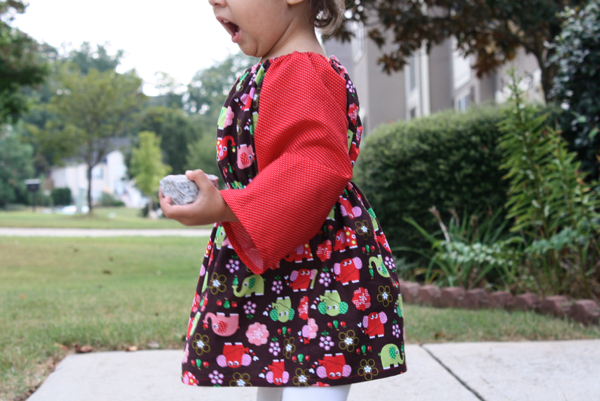 I got the basis for these dresses from this blog post. Go read it, all of it, then come back. No really, go! I’ll wait. Pretty easy, right? Exactly! 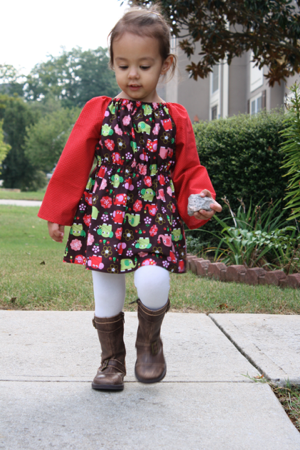 It wasn’t hard to turn this little shirt into a dress. You’ll need to start with cutting it out. 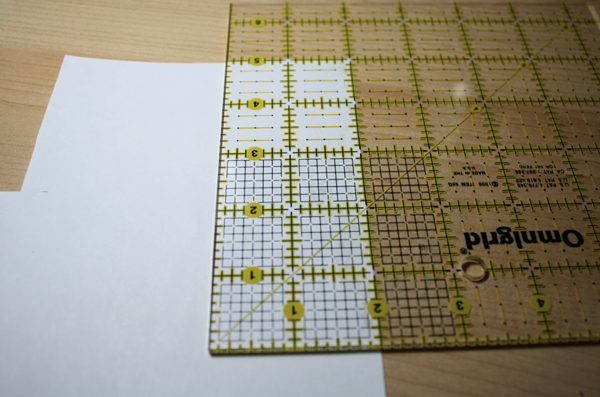 I made this basic template from the measurements she provided in her tutorial. 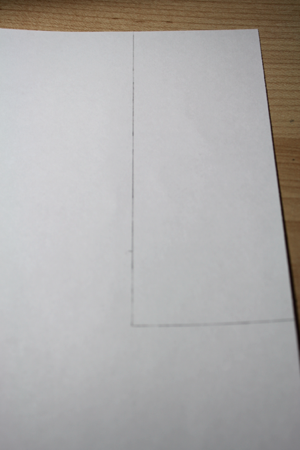 I took a scrap piece of paper and measured in 2″ from the side and down 5″ from the top. 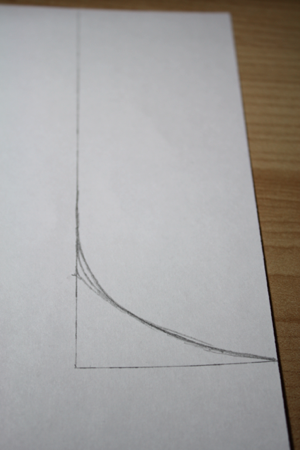 I traced the line, then starting around 4″ down, I started to curve my line until I got to the side of the paper. I just freehanded it. 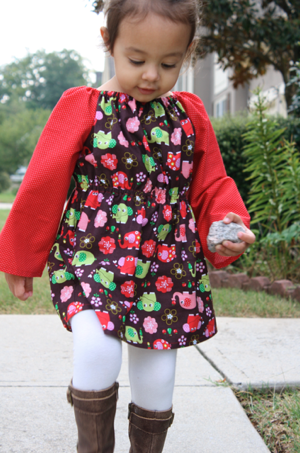 **My dresses are made to fit a 2T/3T. 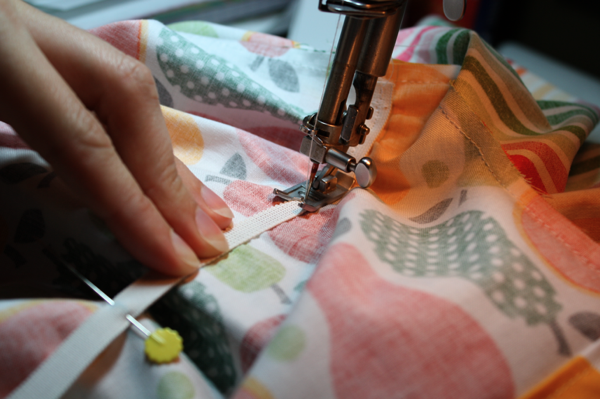 You’ll need to use the IndieTute tutorial to help you for different sizes. 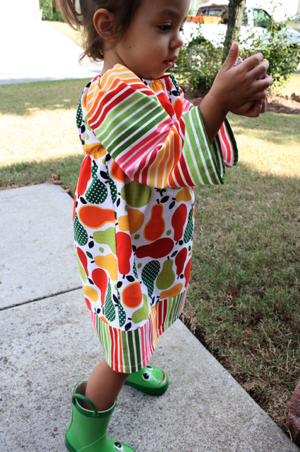 I cut my dress 18″ long (the length of 1/2 yard of fabric) and 16″ wide. 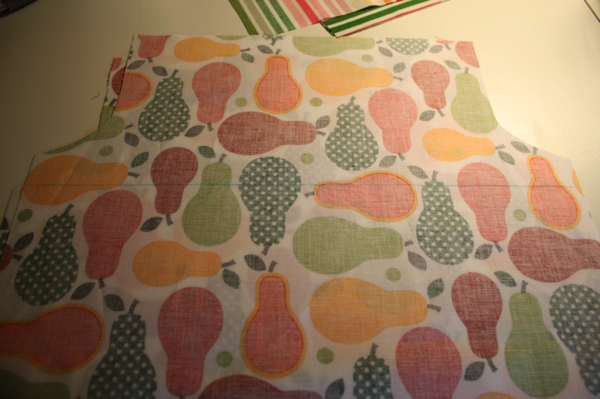 I used a fabric pencil to mark the arm holes at the top and cut them. Cut 2. 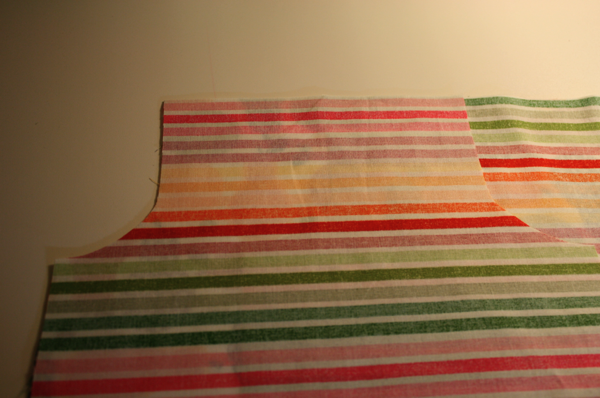 I cut my sleeves 12″ wide and 14″ long. 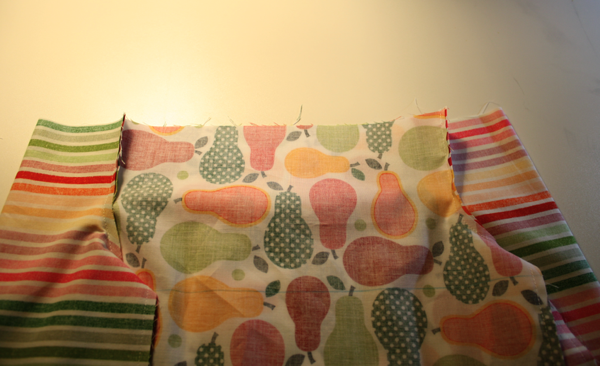 I then cut the same arm hole shape from them. Cut 2. 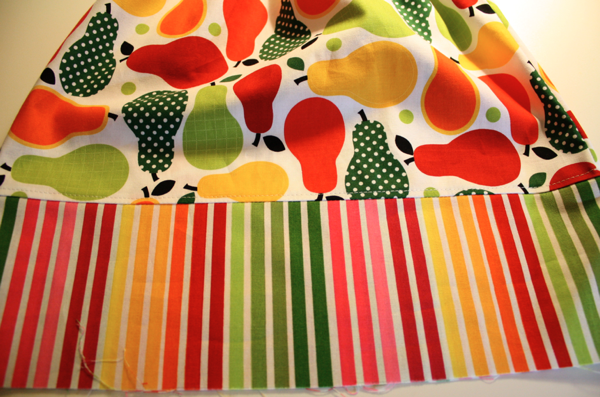 The contrast at the bottom of the dress is 4.5″ long and 16″ wide. Cut 2. To put elastic around the bodice, use a fabric marking pencil or pen to mark a line approximately 6″ from the top edge of the dress. I drew mine 1″ from the bottom of the arm hole. 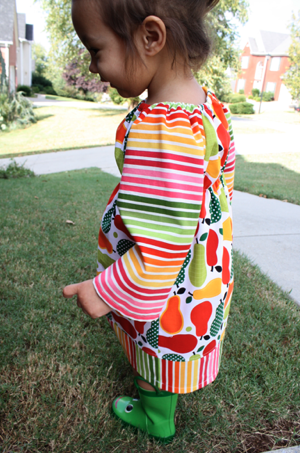 Sew the contrast to the bottom edge of the front and back pieces of the dress. 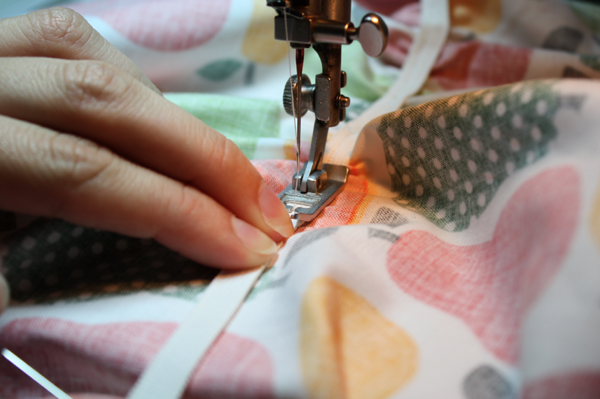 Press the seam toward the dress. 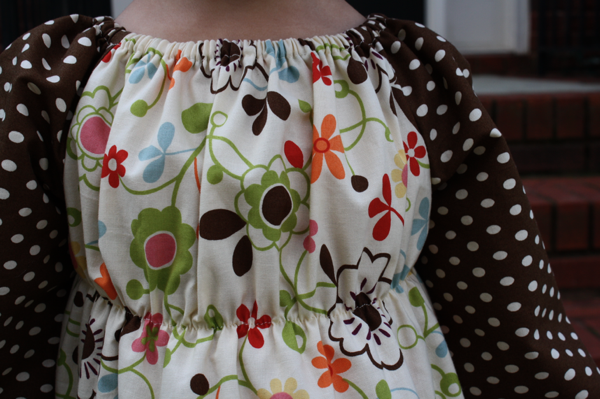 Designate a dress piece as the front. 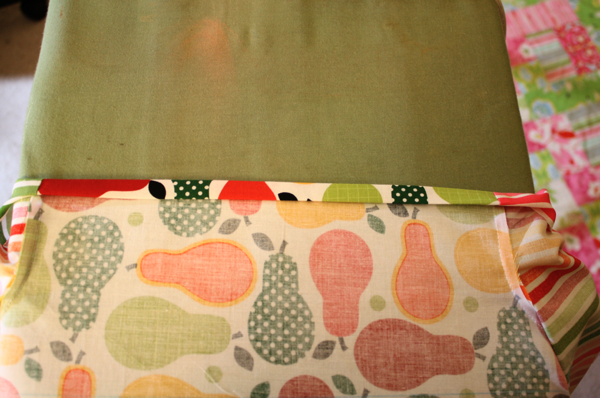 With right sides together, match arm holes and stitch. 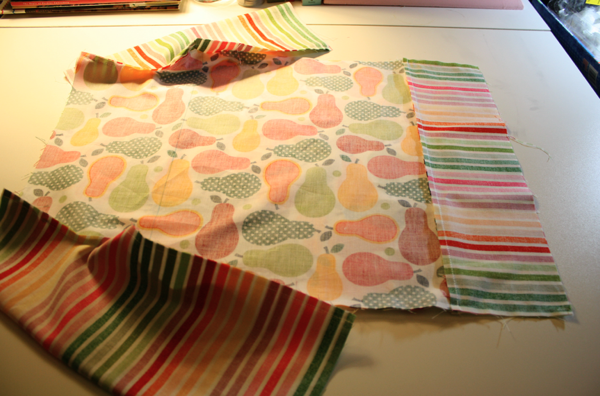 Sew the other arm to the same side. 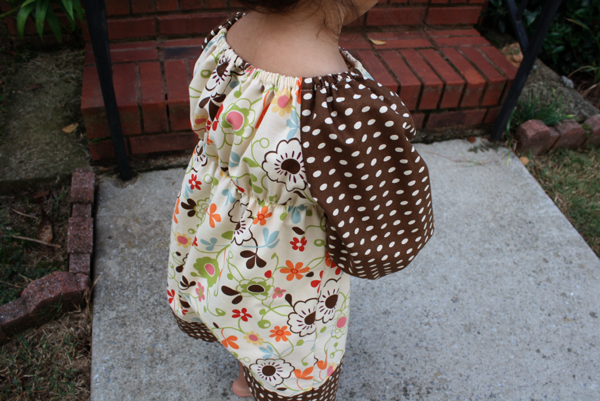 Then sew both arms to the dress back. It should be open along the bottom of each arm and down the sides. 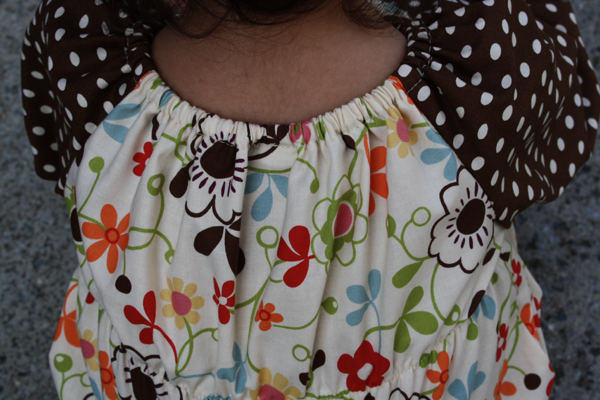 Starting at the bottom of the contrast, sew 1 seam that goes up the side of the dress and ends at the wrist. Next, put a casing around the neck. I used a 1/2″ casing for my 3/8″ elastic. It was perfect! Just turn down 1/2″ and press, then 1/2″ again. Press well. 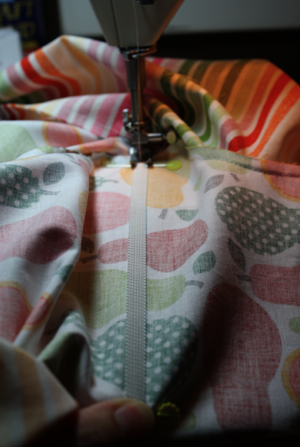 Sew around the casing at 3/8″ seam allowance. 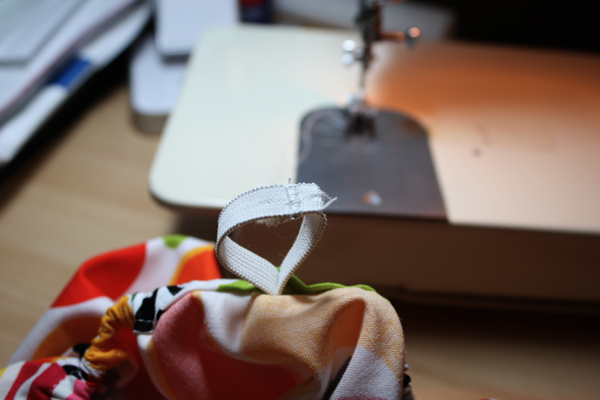 Leave a hole to thread your elastic through, but don’t do it yet! If you don’t want the elastic bodice, skip this part. My elastic was very soft and very stretchy. 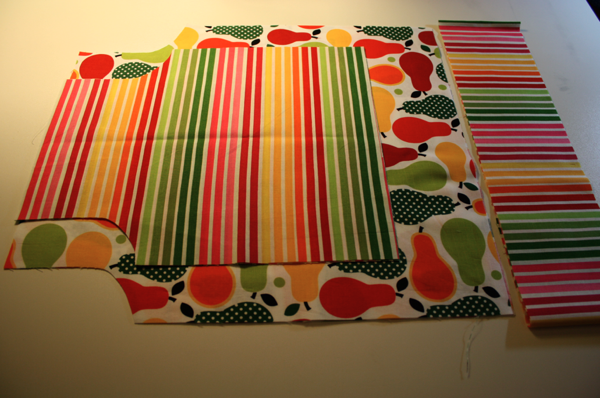 I used 16″, which is the width of 1 side of the dress. 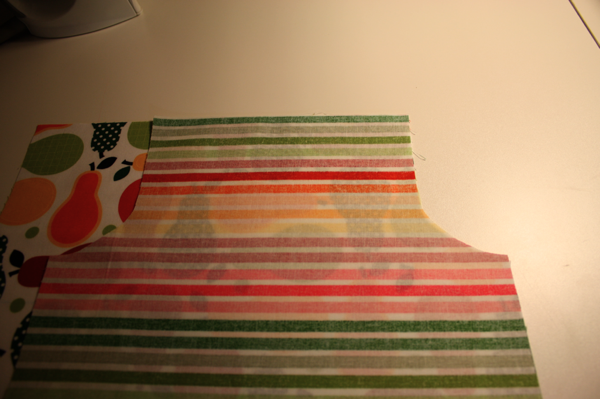 Mark the middle of the elastic with a fabric marking pencil. 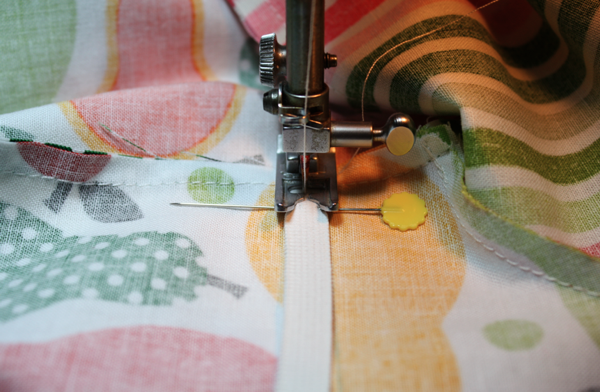 Pin one end of the elastic to the side seam, lining the top of the elastic with the line you drew across the fabric. 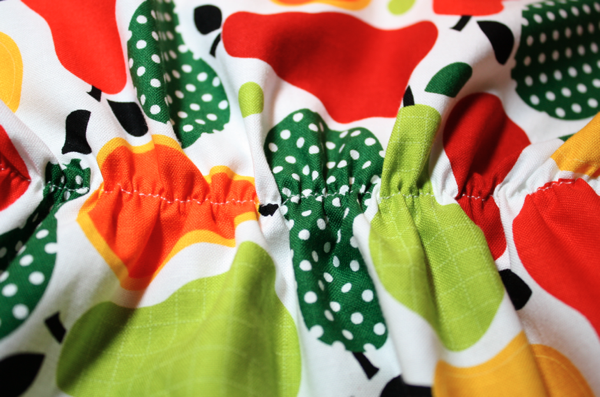 Estimate the 1/4 mark on the elastic and pin it to the middle of the dress. 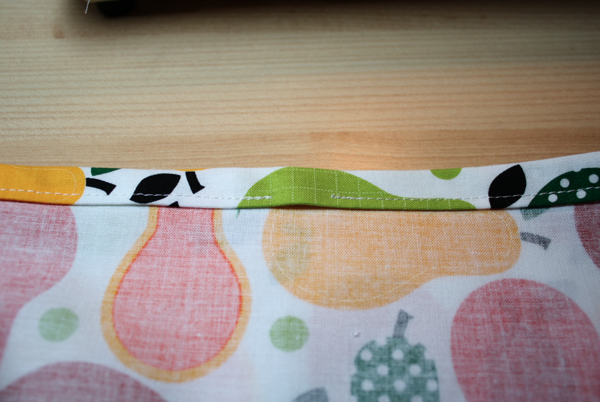 Then pin the half way mark to the seam on the other side. 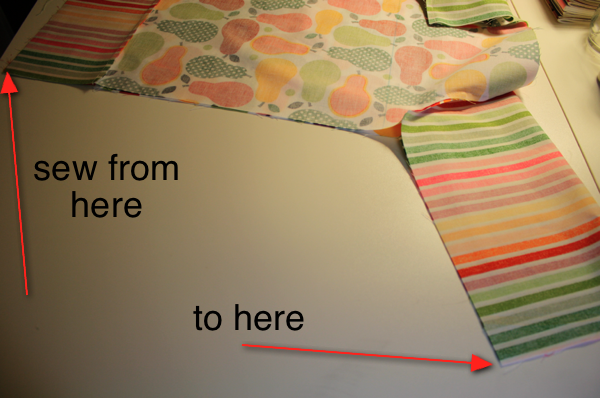 There should be 8″ of elastic left over. 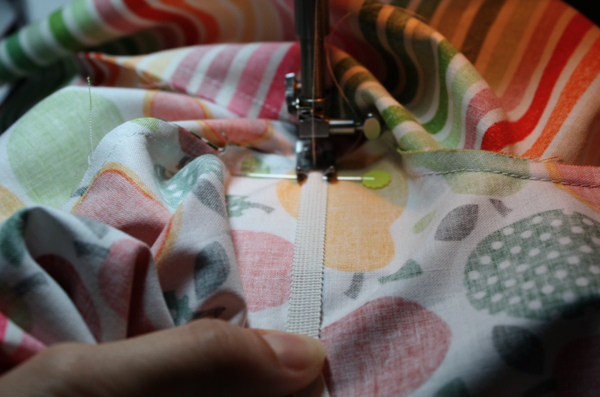 Start by sewing a few stitches to secure the elastic. 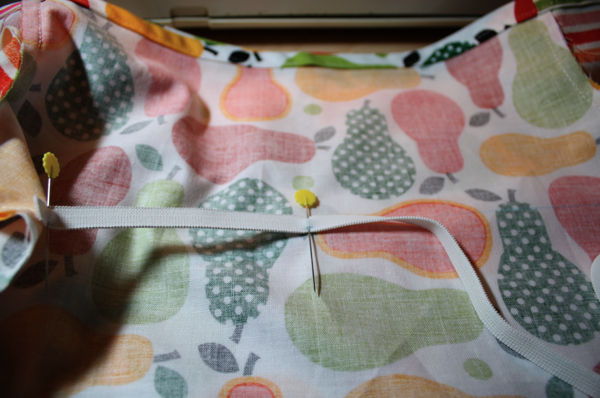 Then hold the pin in the middle and pull so the elastic lays flat, lining up with the line you marked across the dress. 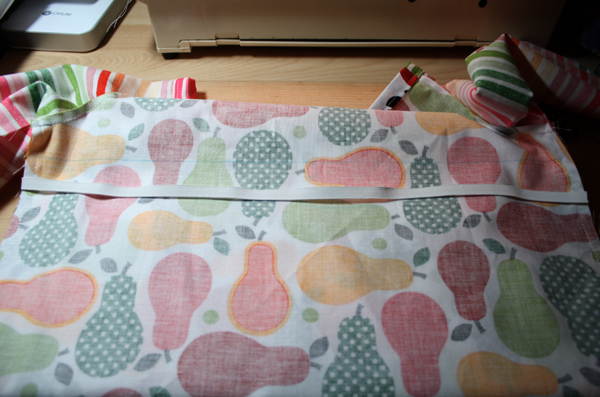 And swap hands so you can use your fingers to hold it down while you sew. Go slow, and use your other hand to help guide it from the back of the machine (I couldn’t take pictures while I did this). Then repeat. 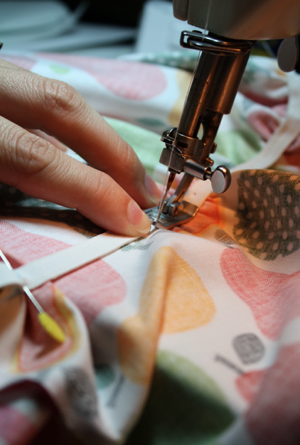 When you get to the other side seam, just pull the elastic, keep it lined up with the line, and continue sewing it down on the other side of the dress. 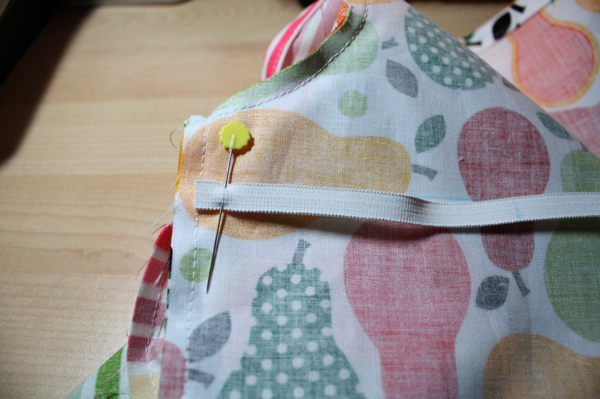 When you get back to the start, overlap the elastic a little and back stitch to secure. You should have a nice, gathered waist! 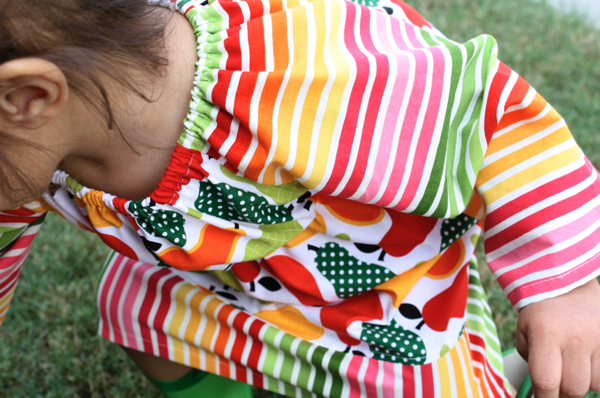 Now take 14″ of 3/8″ elastic, and thread it through your neck casing with a safety pin. 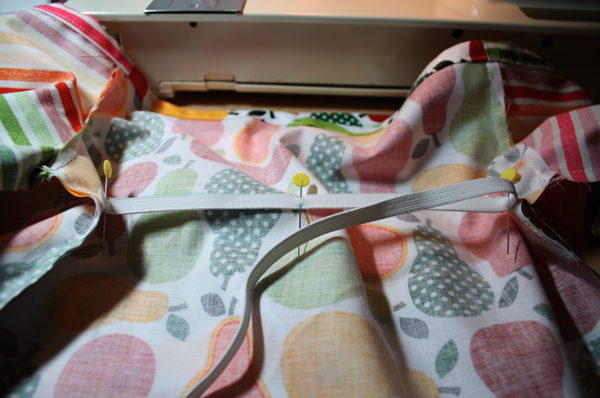 Secure the ends of the elastic together and pull into the casing. 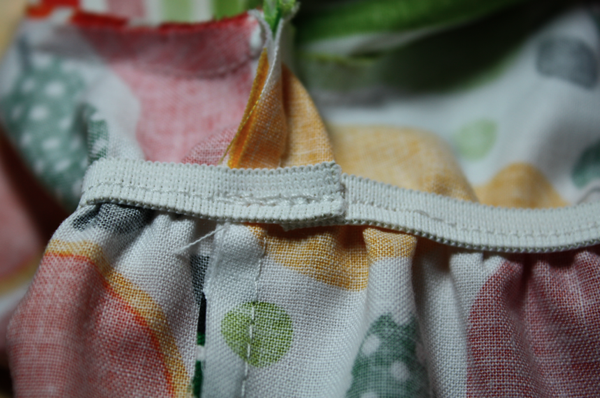 I like to sew a little loop of ribbon when I close up my hole to act as a tag (I know, I need to get labels!). 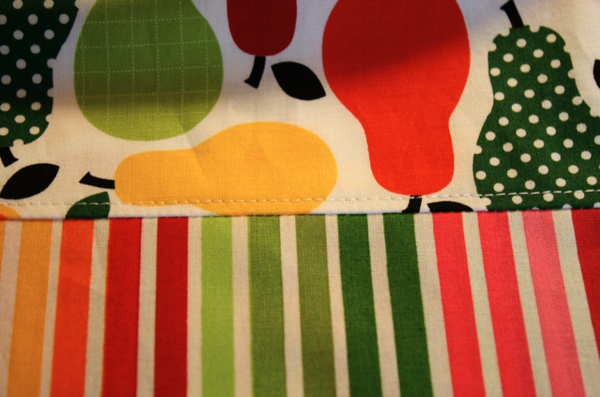 Top stitch along the bottom, making sure to catch the seam from sewing on your contrast. 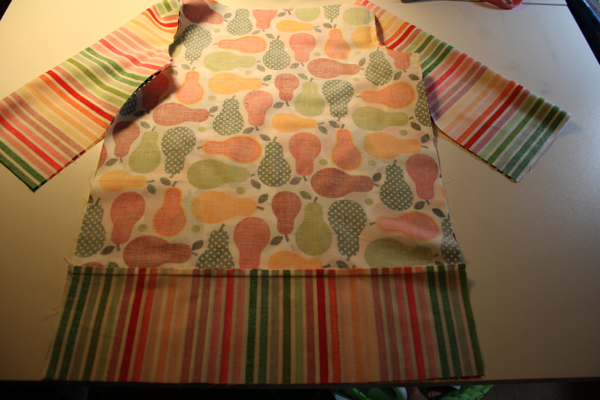 Then hem the bottom and the sleeves and you’re finished!! 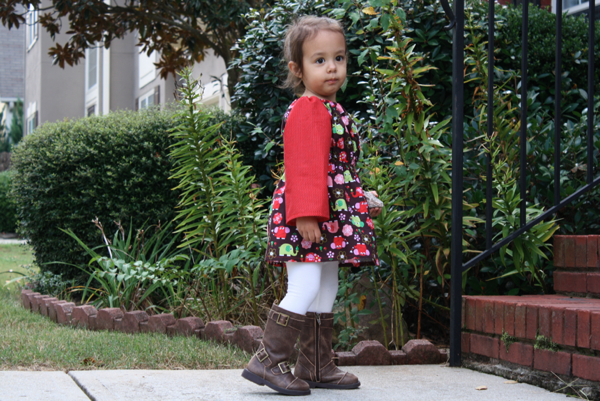 A perfect little dress for cool Autumn days! 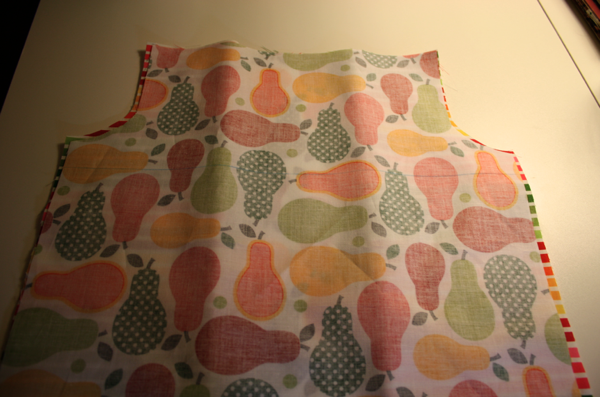 hey i’m new at this and new at sewing. Just making sure we have 6 pieces of fabric right (2 dresses, 2 sleeves, and 2 contrast)? Thanks.